The Third Reich and the cult of Hitler affected an entire continent. People were swept up in it, and many were powerless to resist it. That is what makes some stories so stirring - that people made moral choices that were contrary to the common sentiment but ultimately proved superior to the mindlessness of the herd. Individual stories are instructive. Some might prefer that stories such as this one, which can be embarrassing or considered demeaning, should be kept quiet. I take a different view. People are human, and they can evolve over time to transcend their early life choices. Thus, their tales can be inspirational, but they can only inspire if they are known and told. Even if you don't find an individual tale uplifting, each one shows what life was like for ordinary people during the war and the horrible choices that they were forced to make. 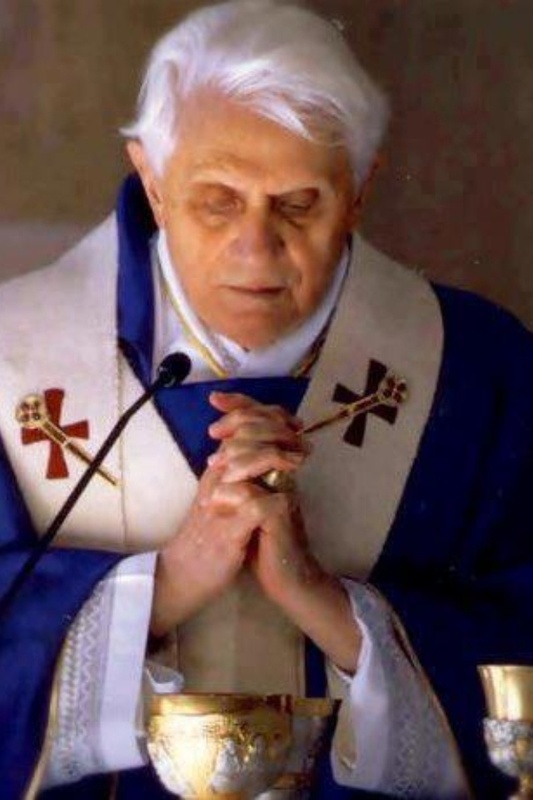 One individual who (improbably) recovered from early incidents that look bad in hindsight to reach epic heights was Joseph Alois Ratzinger (born 16 April 1927). 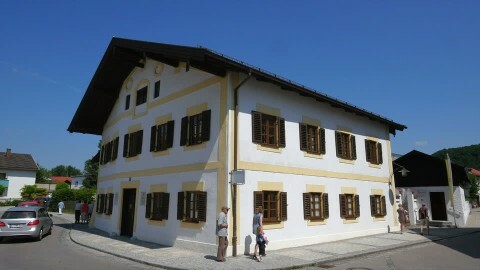 Joseph Ratzinger was born in at 11 Schulstrasse, Marktl am Inn, Bavaria. Bavaria at that time was the center of Adolf Hitler's growing NSDAP Party, and Ratzinger's father was a police officer, a natural candidate for the party. However, Ratzinger Sr. was no fanatic; instead, he was a rebel against the regime. He made his position known. His career suffered and ultimately ended, as a result. That was common in those days, though not common enough to affect the course of history. Ratzinger Senior's son Joseph always had a religious bent. He enrolled in a seminary briefly before the war. By the middle of the war, however, service in the Hitler Youth was not merely voluntary. Everybody who could walk was expected to serve in some way. Ratzinger was drafted into the Luftwaffenhelfer program in 1943 for guard duty. 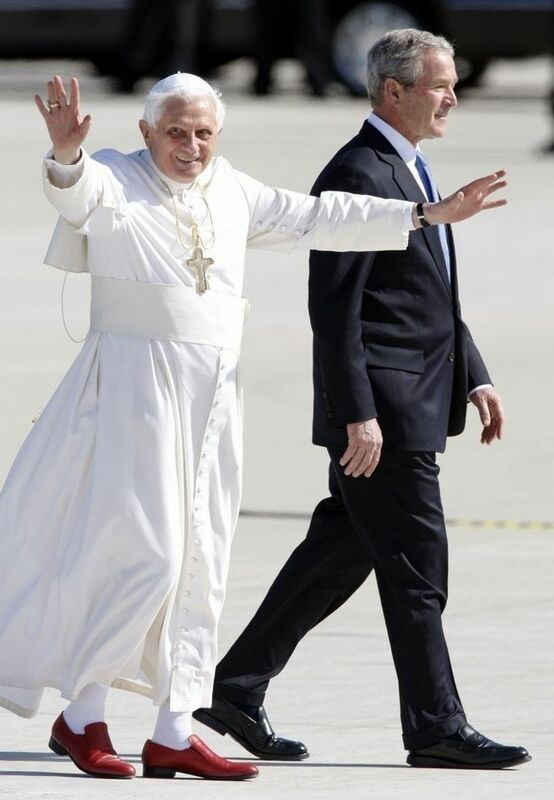 Ratzinger first was assigned to guard a BMW aircraft engine plant in Ludwigsfeld. Later, he was assigned to Unterföhring, then Innsbruck, then Gilching. 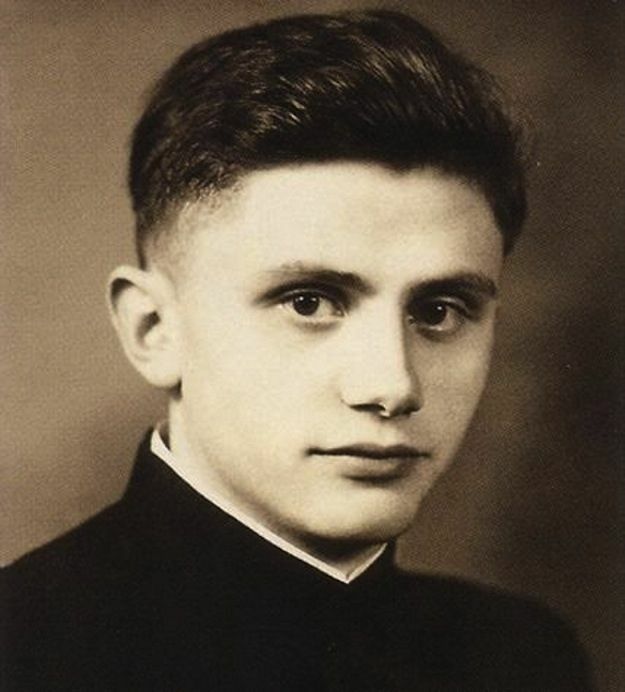 Joseph was discharged from the program on 10 September 1944, but the government needed every pair of hands it could find, so Ratzinger then was drafted into the Reichsarbeitsdienst (a laborer program). The Wehrmacht was setting up anti-tank defenses all along its frontiers, so Ratzinger helped with that along the Hungarian border for a couple of months. On 20 November, the dreaded draft notice for the army arrived, and Ratzinger entered the Wehrmacht at Traunstein. 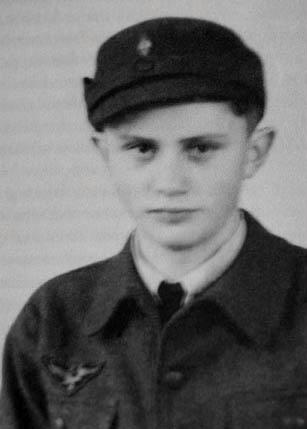 Joseph Ratzinger in his Hitler Youth uniform. 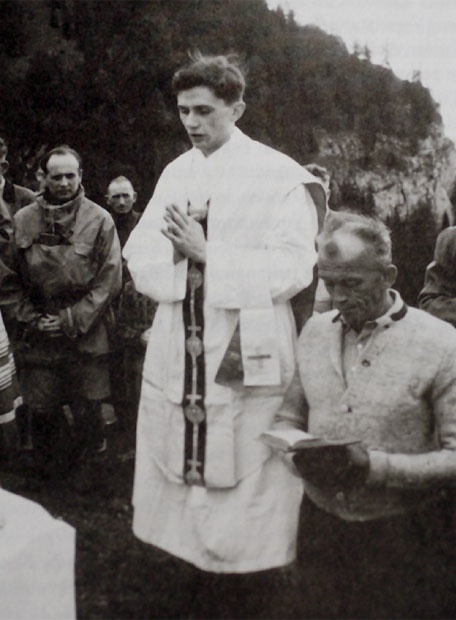 While serving, Ratzinger was posted basically to guard duty near his home. Many boys were used to patrol at factories and other installations from sabotage. 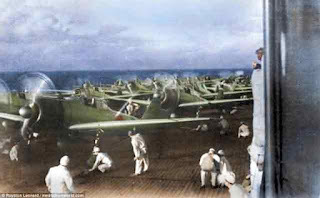 With the war lost, he deserted in early May (along with just about everyone else except the hard-core fanatics) and returned home. Some SS men noticed him a couple of times, but fortunately, they were not fanatics and let Ratzinger go about his business despite standing orders to execute all deserters. Ratzinger entered a POW camp at Ulm and was released on 19 June 1945. Some take a dim view of Ratzinger's path in life. There were people in Ratzinger's situation who absolutely refused to offer any service to the Third Reich, and suffered for that choice. There were no "conscientious objectors" in the Third Reich - if you "objected" you were likely to be sent to Auschwitz or simply executed. In fact, a wartime neighbor of Ratzinger's from Traunstein, Elizabeth Lohner, recalled at the time of Ratzinger's elevation that her own brother-in-law had refused service and indeed wound up in Auschwitz. So, all choices in life are relative, and we all make them and live with them. Moral issues aside, Ratzinger's is an unexceptional wartime story. Ratzinger was 18 when the war ended, of full-service age, and could have been given a panzerfaust, a pat on the back, and sent to a front-line unit. So, in a sense, Ratzinger was very lucky. 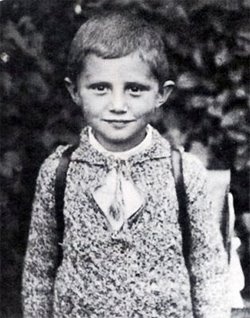 What makes the story extraordinary is that, despite being in the Hitler Youth and his wartime service, Ratzinger quickly resumed his religious studies at a Catholic seminary at Freising. 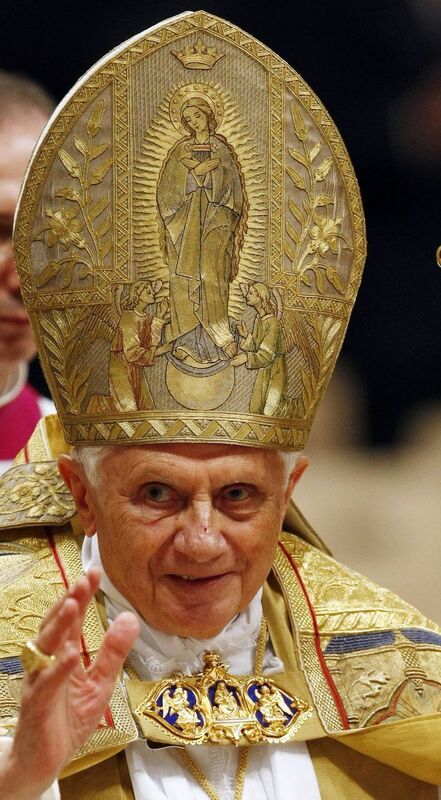 Many years later, in 2005, he became Pope Benedict XVI. It just shows that no matter what your early life, it is always possible to turn things around. Redemption is always possible. The Pope with President George W. Bush.